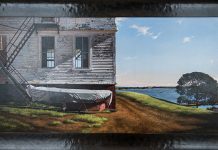 Now in its 52nd year, the All-Island Art Show (AIAS) takes place again next Monday, August 2, at 10 am in the Oak Bluffs Tabernacle. The All Island Junior Art Show for children 15 years old and under, begins Tuesday, at 10 am. AIAS was started in 1958 by Vineyard Haven resident Sydna White, who held it in the garden of her Franklin Street home. When it outgrew Ms. White’s garden, the event moved to the Tabernacle. 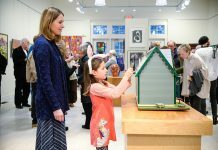 The late artist Anne Culbert, mother of birding expert Rob Culbert, took over the job of running it and was joined by her longtime friend Ms. Wells, who co-chairs the event. The annual event is one of the largest single displays of art on the Island, and, according to Tabernacle Programs Director Robert C. Cleasby, the Tabernacle’s biggest event of the season. At its largest, the art show has accomodated close to 300 Island exhibitors, displaying their paintings, drawings, photography, sculpture, and watercolors for sale. Ms. Wells says that the likely number of exhibitors this year will be closer to 90, the same as last year, and much more manageable for both the artists and organizers. Because of its all inclusive tradition, the non-juried AIAS might easily be called the People’s Art Show. All creative people with an Island address, temporary or permanent, are welcome to show their work for a five dollar entry fee for each piece entered. In addition to five regular entries, artists can submit portfolios with up to 30 pieces, including prints. The fee for a portfolio is $25. Participating artists are eligible for awards ranging from $125 for Best of Show to $50 and $25 for first and second place in individual categories. Last year more than $1,500 in prize money was awarded. Many AIAS exhibitors have gone on to successful artistic careers, including two of its longest-running participants, Millie Briggs of Vineyard Haven and Nancy Blank of Oak Bluffs, who entered for the first time in 1958. Artists Karen Larson Turner and Steve Mills both showed their work at age 16. In making it as easy as possible to participate in the art show, its host, The Martha’s Vineyard Camp Meeting Association, provides registration forms on their web site, mvcma.org, which saves waiting in line for an application at the Campground office the morning of the show. The form includes details and information. Of the show’s 10 categories, Digital and Software-Altered Photography is the fastest-growing and has become the largest. It took over that designation five years ago from painting. Another widely represented category in recent years is Collage & Mixed Media. The fewest entries are in the Sculpture division. A panel of judges chosen by the Art Show Committee selects the prizewinners. This year they are Sam Lowell, Lanny McDowell, Michael Hunter, Sheila Fane, Melissa Breeze, and Donna Straw. The Art Show Committee does limit entries. 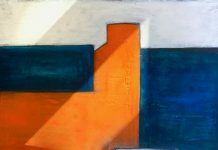 Entrants may not copy work by another artist, nor can they submit reproductions, giclée or otherwise, of their own work. All art must be in its orginal state. Crafts and needlework are not accepted. Nine Vineyard Treasure awards of $25 are awarded in addition to those in the 10 categories (Acrylic; Collage & Mixed Media; Drawing & Graphics; Oil; Pastel; Photography: Black & White Film; Photography: Color Film; Photography: Digital and Software-Altered; Sculpture; Watercolor). Special show-side awards include: Old Sculpin Gallery (two $50 prizes); Ruth Bogan ($50 prizes that represent Ms. Bogan’s interests); Anne Culbert Award for Creativity (two $50 prizes); Della Hardman “Savor the Moment” Award (one $50 prize); Dragonfly Fine Arts Gallery ($50 prize in painting, $50 prize in photography). The All Island Art Show around the Tabernacle at the Campgrounds in Oak Bluffs, Monday, August 2, 10 am. The All Island Junior Art Show for children 15 years old and under, takes place Tuesday, 10 am. Rain date, August 3 and 4. 508-693-0525.